Weekend Historical Happenings: 7/27/13 - 7/28/13 ~ The History Girl! The Chinkchewunska Chapter of the DAR is a nonprofit historical group that has presented an Annual Christmas in July event for more than sixteen years - education an fun for the whole family! Christmas in July is an annual event to make history come alive in Sussex County at the Elias VanBunschooten Museum, a little-known treasure in Sussex County! This event is an annual "open house" and also the Chinkchewunska Chapter of the DAR's main fundraiser to help maintain the museum. This historic house, listed on both the State and National Registers, will be decorated for Christmas by the Chapter's members and open for complimentary tours by period-costumed docents. The house is a wonderful example of a Dutch Colonial style home circa 1787, filled with original pieces from the VanBunschooten and Cooper families, as well as many items of local historical interest. This is the Chinkchewunska Chapter's 42nd year of owning the Elias VanBunschooten Museum! EVERYDAY EVENTS! Complimentary tours of the Elias VanBunschooten Museum. CAR (Children of the American Revolution) will be present to give tours of the historic Ice House/Milk Room and Privy! Lunch will be available for purchase from the Chapter's "Café Elias"; hotdogs, hamburgers/cheeseburgers, various side salads, chips, drinks, etc. Attic treasures sale will offer bargains galore! Silent auction with many great items to bid on every day! The Museum Gift shop will be open each day to purchase memorabilia, books, and crafts. General Washington described Benedict Arnold as "more unfortunate than criminal." Nevertheless, Arnold, more than anyone else in our history, came to embody traitorousness. Arnold, ostensibly a General in the Continental Army, conspired with British Major John André to surrender West Point to the British before the plan was exposed. André was captured and executed; Arnold managed to live out his live in the service of the Crown. Reenactors Gary Petagine and Sean Grady know the tale well. Respectively, they perform as Arnold and André, and on Saturday at 2:00 pm, they will be bringing their talents and expertise to Paterson's Lambert Castle in a program entitled "Rendezvous with Treason." "Anti-heroes" such as Arnold and André are indeed unique subjects for re-enactment, considering the American fascination with heroes such as Washington and Lincoln. This unusual program presents the embittered General Arnold and the doomed Major André in all their unabashed glory. For more information, call 973-247-0085 or www.lambertcastle.org. The Mercer County Park Commission will offer free Saturday evening hayrides at Howell Living History Farm on Saturday from 5:00 - 8:00 pm. The horse-drawn rides last 20 minutes, carrying visitors over the lanes of the 130 acre working farm, located in Hopewell Township. During the program, visitors can also take self-guided tours, picnic in the picnic area and join a marshmallow roast. Rides will leave the barnyard area every 25 minutes beginning at 5:10 pm, with the last ride departing at 8:00 pm. Rides will be given on a first come, first serve basis to the first 200 visitors. Rides are intended for individual and family participation; groups cannot be accommodated. A wheelchair accessible wagon is also available. Individuals who would like to ride on this wagon should call 609-737-3299 in advance and ask for Kathy. The wagon is horse-drawn. On the dates when evening hayrides are offered, the Farm will be closed during the day. 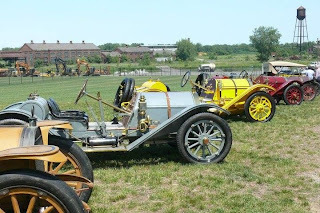 In keeping with the tradition of the Roebling Company and fine automobile manufacturing, the Roebling Museum will host its Fourth Annual Car Show on Saturday, from 10:00 am - 3:00 pm. It is open to all cars and trucks. It will be a day full of food and fun for the whole family! Rain date is Sunday, July 28, 2013. Spectator admission: $5.00; Children Under 12 Free. For more information, call 609-499-7200 or visit www.roeblingmuseum.org. All aboard! Historic Cold Spring Village's Annual Railroad Days will be held on Saturday and Sunday from 10:00 am - 4:30 pm. Sponsored by the Marsh & McLennan Agency, Railroad Days is the perfect outing for folks interested in railroad memorabilia, model and toy trains, or just enjoying a unique collection in a unique historical setting. In the Village Welcome Center, under the Friends' Pavilion and along the Village's shady lanes, visitors will find presentations and displays from a variety of groups. On display in the Welcome Center will be the South Jersey Garden Railroad Society's fifteen-foot G scale railroad as well as the Strasburg Model Railroad Club's display of the Pennsylvania-Reading Seashore Lines HO scale layout. Near the Ice Cream Parlor, guests can see the South Jersey Garden Railroad Society's display honoring every child's favorite tank engine. Additional groups, including the 4-H Club and Just for Fun, will exhibit a variety of models and landscapes. Railroad ephemera and memorabilia will be on display and available for purchase near the Welcome Center. At 1:30 pm in the Welcome Center on both Saturday and Sunday, Jim Stephens, HCSV Education Director, will present a talk on Richard Trevithick, the little known inventor of the modern steam engine. Children can enjoy free toy train rides around the Village, Saturday 11:00 am - 3:00 pm and Sunday 12:00 noon - 4:00 pm, departing behind the Welcome Center. The Family Activity Area will feature special event-themed children's take-home crafts. Join Museum Curator Bernadette Rogoff on Sunday at 1:00 or 3:00 pm at the Monmouth County Historical Association museum in Freehold for special Gallery Talks about the Micah Williams: Portrait Artist exhibition. Over the last 20 years, Ms. Rogoff has completed a comprehensive study of the artist's life and work and will share her extensive knowledge with guests while touring the exhibition. 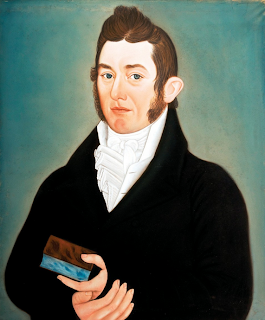 Traveling portrait artist and New Jersey resident Micah Williams (1782-1837) was a prolific artist who has 272 known existing works. His works are represented in many major museums and are highly sought after by folk art collectors. Yet, there has never before been an exhibition dedicated solely to the work of Micah Williams. The Micah Williams: Portrait Artist exhibition brings together sixty-seven of Williams' pastel and oil portraits when seen together, tell a story about the new America of the nineteenth century. Monmouth County Historical Association has embraced Williams' work since the 1950s when a Monmouth County resident published the first of four scholarly articles based on the museum's collection of portraits. Now, over 60 years later, the Association still holds the largest public collection (23 works) of Micah Williams' work. The first floor of the museum is accessible to persons with disabilities. Anyone unable to visit the second floor of the exhibition will be given a seated presentation by Ms. Rogoff using images of the portraits located on the second floor following the main tour. Space is limited so please call 732-462-1466 to reserve your spot on the tour. A color catalogue produced for the exhibition will be available for purchase at the talks. The catalogue is $45 and $40 for Association members. Monmouth County Historical Association is a private non-profit organization that has been working to preserve Monmouth County history and provide educational opportunities since its founding in 1898. The Association's Museum and Library is located at 70 Court Street, Freehold, NJ. Museum hours are: Tuesday - Saturday 10:00 am - 4:00 pm. The Library is open Wednesday through Saturday. For membership or admission fees and further information, please call 732-462-1466 or visit www.monmouthhistory.org. Marshall will return to the market next month to discuss "How to Look at Old Barns and 'Read' the Stories They Tell," on August 25, from 10:00 am - 12:00 noon. Marshall has more than 25 years of experience with land protection and historic preservation, and has played a role documenting, researching and photographing more than 10,000 old barns and has written numerous books. This July, Macculloch Hall Historical Museum presents its "Summer Series" of live music in the historic gardens. Programs take place at 4:00 pm each Sunday in July. The gardens were restored in the 1950s by the Garden Club of Morristown and visitors will have the opportunity to explore through a variety of summer blooms in the gardens and relax on the large lawn during the program. Guests may bring picnics, and are encouraged to bring blankets or chairs and settle back for a late afternoon of great music in a lovely setting. On Sunday, Macculloch Hall Historical Museum is proud to present a fun, family-friendly summer's afternoon performance by singer-songwriter and guitarist Gary Reed. Mr. Reed has reemerged as an accomplished and contemporary voice - with lyrics that resonate from that earlier time. An outstanding guitar player and performer, he is a premier fingerstyle guitar player and guitar champion winner who writes and plays unique solo guitar arrangements ranging from Joplin to the Beatles, New Age to Yazoo and "Finger Popping" original tunes. His style comes out of the 1960's revival of the black blues guitar players and performed with guitar guys from New York City and San Francisco. Gary started his performing career in the Village in the late sixties and early seventies being a regular player at the Bitter End, Folk City, Café Wah, Max's Kansas City, The Village Gate and most of the clubs in the Village at that time. He had the opportunity to open for some great players such as: Jerry Jeff Walker, Billy Joel, Randy Newman, Joe Walsh and Jeremy Steig. The "Summer Series" programs will begin each Sunday in July at 4:00 pm. Tickets can be purchased beginning at 1:00 pm on the day of the program. No advance sales. After 4:00 pm, tickets for the performance will still be available to purchase. Program tickets are $12; $10 for members, seniors, students, and those who purchased a Museum tour ticket that day. Free for children under 12. Please, no dogs during programs in the garden. In the case of inclement weather the performance will be moved indoors. The announcement will be made on the Museum's main phone message on performance day. Tours of the museum's period rooms and galleries take place throughout the afternoon (separate admission). Last tour of the period rooms leaves at 3:00 pm. The Museum will remain open until 4:00 pm, when the performance begins. Macculloch Hall Historical Museum preserves the history of the Macculloch-Miller families, the Morris area community, and the legacy of its founder W. Parsons Todd through its historic site, collections, exhibits, and educational and cultural programs. The Museum is open for house and exhibit tours on Wednesdays, Thursdays, and Sundays from 1:00 - 4:00 pm. The last tour leaves at 3:00 pm. Adults $8; Seniors & Students $6; Children 6 - 12 $4. Members and children under 5 are free. The gardens are open (free of charge) during Museum hours. For more information, call 973-538-2404 ext. 10 or visit www.maccullochhall.org. Macculloch Hall Historical Museum is located at 45 Macculloch Avenue, Morristown, NJ. The Montague Association for the Restoration of Community History (MARCH) will open the circa 1790 Foster-Armstrong House on River Road and the Nelden-Roberts Stonehouse, at 501 Route 206 for Sunday afternoon tours between 1:00 and 4:00 pm. Both are situated within the Delaware Water Gap National Recreation Area in Montague, NJ and were originally part of the Tocks Island Dam acquisitions. These two sites are utilized by MARCH and portray the area's heritage. Tours will be conducted by docents at each house every Sunday through August from 1:00 - 4:00 pm. See the new display of hunting, fishing, and food preservation, ferry and lime kilns, a tavern room, an Indian exhibit, items from the Brick House Hotel, a special display of the Rock View Resort, a quilt collection, antique christening and baby clothes, hand-made covered bridges from around the United States, a Victorian bedroom, a school-room display, a military room with artifacts from five war periods, and old school books from Montague schools. There is no charge for either museum, but donations for house maintenance are welcomed. On Sunday, watch a chair caning demonstration by Richard Jones on the porch of the Foster-Armstrong House. Questions about all types of chair seat repairs are welcomed. He will bring many caning examples to see. For more information, visit www.montaguehistory.org. The Nathaniel Drake House in Plainfield, New Jersey, was registered on June 19, 1973, by Charles H. Detwiller, Jr., who was an architect and former president of the Historical Society of Plainfield. The photographer was Harold Morse, who was a local photographer and also a former president of the Historical Society of Plainfield. Since the Drake House was placed on the National Register in 1973, there are now nine individual sites and seven districts in the City of Plainfield. The City of Plainfield has a Historic Preservation Commission, and there are an additional twelve individual sites and three districts designated as historic within the City limits. Allaire Village, Inc. presents an 1830s Temperance Rally at The Historic Allaire Village located in Allaire State Park on Sunday at 1:00 pm and 2:30 pm. This special event focuses on the villagers of the Howell Iron Works Company of the 1830's and their crusade against the evils of "Demon Rum" and immoderation. It also features a Ladies' Temperance Social to celebrate the advantages of sobriety. There will be a $5/car parking fee to the State Park; admission to the event is free and there is a charge to enter the historic buildings. The Historic Village opens at 12:00 noon and closes at 4:00 pm. The Temperance movement grew up with the Industrial Revolution. Increasing use of machines for manufacturing led to a greater concern for competent and sober workers in America's factories. But the movement, whose original purpose as to shape and more responsible society through moderation of life's pleasures, soon grew many branches and encompassed many other social causes. The fight to rid the land of the dangers of alcohol was becoming more prominent and women began to play a greater role in the crusade by the 1830's. The event begins with a meeting and rally of the Howell Work's Temperance Society in the Historic Village and will feature inspiring speeches rallying against the horrors of "Demon Rum." Villagers will encourage visitors in the taking of the Temperance oath. Visitors are also welcome to participate in 19th century games and amusements with the villagers. It's a great day of history and family fun. The Bakery and General Store will be open for shopping and refreshments. Allaire Village, Incorporated is licensed by the State of New Jersey to operate the 40-acre, Historic Village at Allaire, the site of James P. Allaire's Howell Iron Works Company in the 1830s. Allaire Village, Inc. receives no state funding towards the educational programming presented throughout the year, but is strongly supported through private donations, membership fees, fund-raising events, and patronage of their retail stores. Lots of historic places to visit this weekend, Kelly. Keep your love for history and the adventures of you visits and travels, in your heart always!